Phosphates are chemicals containing the element phosphorous, and they affect water quality by causing excessive growth of algae. About 3 1/2 pounds of phosphates per person enter the environment in the United States annually from farms, yards, waste water and factory waste. Phosphates in water feed algae, which grow out of control in water ecosystems and create imbalances, which destroy other life forms and produce harmful toxins. Excess phosphates create water that's cloudy and low in oxygen. All plants need phosphates to grow, but phosphorous is normally present in surface water at a rate of only 0.02 parts per million. Introducing additional phosphates in water results in a massive growth of algae, which are aquatic plants including many single-celled, free-floating plants. Excessive amounts of algae cloud the water in an effect called an algal bloom, which reduces the sunlight available to other plants and sometimes kills them. 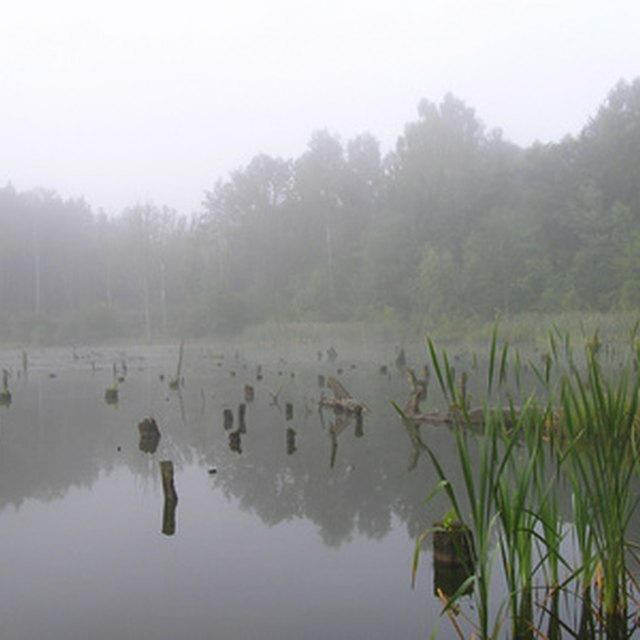 When the algae die, the bacteria that break them down use up dissolved oxygen in the water, depriving and sometimes suffocating other aquatic life. Fertilizers containing phosphates pollute surface water. Phosphates enter water systems naturally by dissolving out of rock, but phosphates are also mined and made into chemical fertilizers to grow crops. Crops feed farm animals, which excrete phosphate-rich manure. Applying chemical fertilizers to soil already saturated with phosphates and spreading excessive amounts of manure on land causes phosphates to run off during heavy rainfall and pollute nearby water sources. 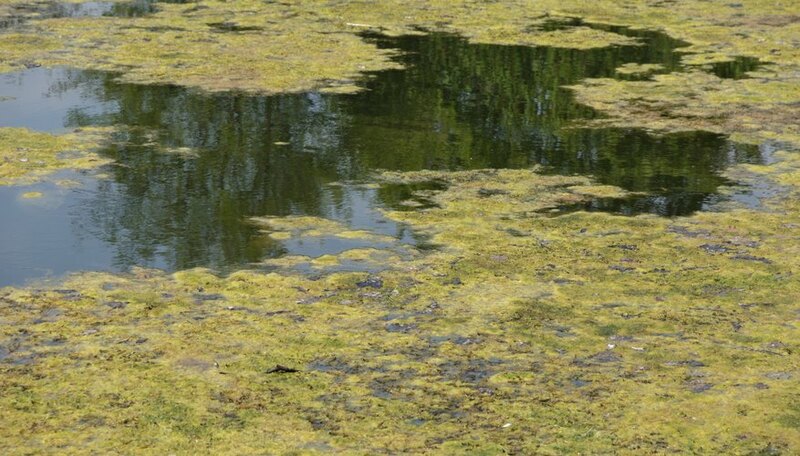 When the amount of total phosphorous exceeds 100 parts per billion (ppb) in streams or 50 ppb in lakes, eutrophication -- the effect of algal blooms -- is a danger. Excessive phosphate levels also affect the processes in drinking water treatment plants. Phosphates in water come from a range of sources. Runoff from fertilizer on lawns and gardens is one contributor, and others include human and pet sewage, chemical manufacturing, vegetable and fruit processing and the pulp and paper industry. Soil erosion in areas lacking sufficient vegetation to hold the soil in place during strong winds and heavy rain is another source of phosphate pollution. Most household detergents once contained phosphates because of their effectiveness at removing dirt, but now legislation prohibits their use in most products except specialized detergents and industrial cleaners. Farmers and homeowners can help prevent phosphates from affecting water quality. Soil tests indicate the amount of plant nutrients required in fields, lawns and garden borders, and help avoid over-fertilization. Planting native vegetation and avoiding removing vegetation reduces soil erosion. You can create a garden compost of leaves, plant debris and lawn clippings for a slow-release, low-phosphate plant nutrient source and soil conditioner. Clean up after your dog when you take him for a walk by picking up his feces in a plastic bag and putting it in the trash. Green, Jenny. "How Do Phosphates Affect Water Quality?" Sciencing, https://sciencing.com/phosphates-affect-water-quality-4565075.html. 06 August 2018.